Is Moscow looking to make Syria’s opposition a deal? A recent meeting between a Russian presidential envoy and a Syrian opposition leader in Cairo has sparked much rumor and speculation. RBTH has polled Russian observers for their views on the reasons behind the meeting with opponents of Syrian President Bashar al-Assad. Speculation of a possible move by Russia to win support from the Syrian opposition is growing following a recent meeting between Russian Deputy Foreign Minister Mikhail Bogdanov and Ahmad Al-Jarba, one of the leaders of the movement to oust Syria’s leader Bashar al-Assad. Little is known about the outcomes of the meeting which took place in Cairo on Oct. 17. Yet observers suggest that Russia may be acting as an intermediary in talks between the Assad government and the moderate opposition to unite against a common enemy. According to Vyacheslav Igrunov, head of the Institute of Humanitarian and Political Studies, Damascus can no longer ignore the Syrian opposition and is in no position to destroy it. “It is too weak to fight wars on several fronts at the same time, while the war with the opposition is making it difficult to build a single front against Islamic State,” he said. Furthermore, the opposition enjoys the support of Saudi Arabia, Turkey and the U.S., which makes tensions even higher. In this situation, it would be sensible to join forces against a common enemy, but to do that, first agreement on the status of the Syrian opposition has to be reached, said Igrunov, adding that Russia is ready to act as a key intermediary. The main problem continues to lie in the sides’ lack of readiness for a compromise. According to Igrunov, Assad has turned out to be more flexible, as he has – allegedly – announced that he is prepared to back down, which cannot be said of the opposition forces. “From them, we have not heard such sensible statements about the possibility of fighting ISIS together,” said Igrunov. However, there is still no uniform opinion as to who this moderate opposition is. While there is little disagreement between Russia and the West that ISIS is the enemy, attitudes to the various rebel groups fighting against the Assad regime are rather more complex and far from uniform in regard to who is seen as a terrorist and who is not. “The meeting may have discussed exactly this: that there are structures and organizations that do not consider themselves terrorists, while Russia, on the contrary, does,” said Syukiyainen. It is quite possible, he added, that Russia put the issue point-blank: “If you are not terrorists, then show initiative in the political settlement of the conflict.” If they are indeed guided by Syria’s interests rather than instructions from abroad, they will agree to a compromise, he said. If not, they are not patriots of Syria. “This is the objective behind the meetings our high-ranking diplomats are having,” said another Oriental Studies expert, Konstantin Dudarev. Moscow’s efforts to involve moderate Syrian opposition figures in the peace process have been going on for a long time, according to Andrei Fedorchenko, head of the Center for Middle Eastern Studies under the Moscow State Institute of International Relations. “Since the start of the year, Moscow has already conducted two consultative intra-Syrian meetings, while in April it came up with eight points for the Moscow platform with proposals for getting out of the crisis. It contains an appeal to put more pressure on regional and international players to stop any actions supporting terrorists and an appeal to free occupied territories. 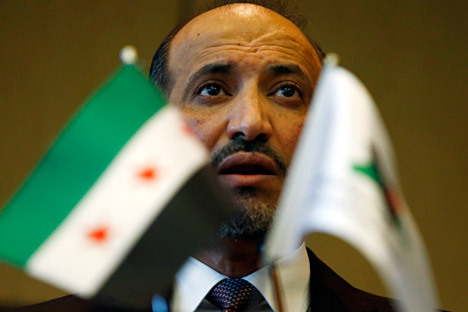 That declaration was adopted by the moderate Syrian opposition,” he said. All that is happening now is an attempt to create a broad anti-terrorist coalition involving regional players and various Syrian forces – though how realistic this is remains an open question, according to Vyacheslav Igrunov. “The thing is that the Syrian opposition will not run counter to its main sponsor, Saudi Arabia. And Saudi Arabia is so far not ready for a compromise with the Assad regime. Without Saudi Arabia, Russia will not succeed. So there are some tough negotiations ahead,” he said. Are Russia and the U.S. on the brink of a proxy war in Syria?